There has been a big fall in the number of East Europeans registering to work in the UK, official figures show. Some 720,000 National Insurance numbers were issued to foreign workers in the year to September 2008, the Office for National Statistics has said. That is 7% down on the previous year, with the biggest decline - 21% - coming from new EU nations such as Poland. 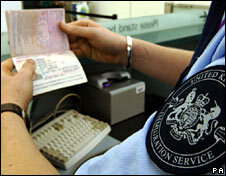 But figures also show a 290,000 rise in overseas-born UK residents, which hit 6.5 million in the year to June 2008. Separate figures suggest the number of migrants coming to work in the UK from Poland, Lithuania, Latvia, Hungary, Slovakia, Slovenia, Estonia and the Czech Republic, are at their lowest levels since those countries joined the EU in 2004. This was mainly explained by a drop in approved Polish applicants for work, which fell to 16,000 in the final quarter of 2008 from 36,000 in the same period in 2007, the Home Office said. Border and Immigration Minister Phil Woolas said: "The number of Eastern Europeans coming here to work is dramatically falling and research suggests that many of those that came have now gone home. "Nevertheless, the government is doing everything it can to ensure migration is working for the British labour market and the country as a whole." There are no official figures on the outflow of migrants to accession countries but Sir Andrew Green, of pressure group Migration Watch, said the flow from and to Eastern Europe would "come into balance before very long" and the "main pressure was now immigration from outside the EU" which unlike EU migration the government could control. A cross-party group on migration, headed by Labour MP Frank Field and Conservative Nicholas Soames, also welcomed the figures and said it was time to "focus on immigration from outside the EU". Other figures released earlier reveal the number of people from outside the EU granted the right to settle in the UK was 145,965, an increase of 17% on the previous year. This was largely down to an increase in the number of people allowed to stay because of their job, which returned to 2005 levels. Asylum applications were 10% higher in 2008 at 25,670 but there was a 5% increase in removals and voluntary departures compared to 2007, with 66,275 leaving the UK that way. But figures for the final quarter of 2008 suggest a slight fall of 2% in the number of asylum applications. There was a slight dip in asylum removals in the same period. There was also a 27% fall in the number of asylum seekers in receipt of government support in the final quarter of 2008, from 44,495 to 32,580. But there was a significant increase in the number of failed asylum seekers given emergency help with food and accommodation, which went up to 2,580 in the final quarter of 2008, an increase of 63% on the same quarter in 2007. The figures also suggest that the Home Office met its target for the removal of foreign national prisoners. Commenting on the figures, shadow immigration minister Damian Green, for the Conservatives, said: "Even at a time when short-term applications are falling because of the dreadful state of the British economy, grants of settlement are up 17% mainly because of foreign workers who have come here and decided to stay. "This shows how foolish Gordon Brown's promise of British jobs for British workers was. "The asylum statistics are ominous, as they show the first signs of a system sliding back into the chaos of previous years. Applications are up 10%, decisions are down 11%, and the number waiting for an initial decision has risen by a third. "Slow decision-making and rising backlogs are bad news for taxpayers and genuine refugees alike."